Do you snore? Has CPAP failed you? Obstructive Sleep Apnea (OSA) is a serious condition. During sleep muscles relax, including those that control the tongue and throat. The soft tissue (or flesh) at the back of the throat can sag, narrowing the airway. Incoming air then makes the tissue at the rear roof of the mouth (the soft palate), the flap of skin hanging from the palate (uvula) and the throat vibrate - a sound we know as snoring. There is an alternative to CPAP!! 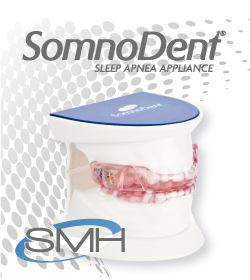 SomnoDent is an Oral Sleep Apnea Appliance consisting of two dental plates, which look similar to a sports mouth guard. 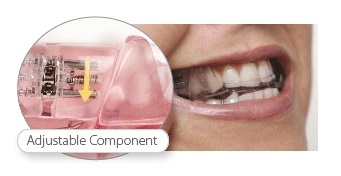 The appliance is custom made to fit your mouth and should be worn while you are sleeping to maintain the patency of the upper airway by increasing its dimensions and reducing collapsibility.